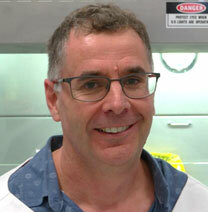 Dr Fraser Russell is a cardiovascular pharmacologist at the University of the Sunshine Coast. His research group is developing novel strategies for the management of chronic wounds and abdominal aortic aneurysm. Studies are aimed at determining the efficacy of natural products derived from honey and stingless bee cerumen, and omega-3 fatty acids that are present in fish oils. Hamilton, K.D., Brooks, P.R., Ogbourne., S.M., Russell, F.D. (2017). Natural products isolated from Tetragonula carbonaria cerumen modulate free radical-scavenging and 5-lipoxygenase activities in vitro. BMC Complementary and Alternative Medicine, 17:232:1-8. Massaro F.C., Brooks P.R., Wallace H.M., Russell F.D. (2011). Cerumen of Australian stingless bees (Trigona carbonaria): gas chromatography–mass spectrometry fingerprints and potential anti-inflammatory properties. Naturwissenschaften, 98;329-337.